Stop Press. Tempeh cooking demos Monday, 26 March. Morning and evening. I mentioned in my last blog that I was planning to hold a session. These are the dates I’ve decided on. Book now! Space is limited. Send me a message via the contact form, or if you know my other contact details, call me, text me, or message me. Just let me know your preferred day and I will confirm with details. I keep coming across a vegetable called chayote in Latin American recipes. It’s also used in Cajun cuisine (they call it mirliton), and by a huge variety of different names throughout south and east Asia. In Malaysia it’s called, weirdly, ‘English gourd’; in Indonesia we call it labu siam, which means ‘Thai squash’. Whatever it’s called, I love it! Chayote (pronounced chay-o-tee) is a member of the gourd family, so related to squash and pumpkins, melons and cucumbers. Its flesh looks a bit cucumbery, but firmer—and you normally cook it. It has a very delicate—some might say nondescript—slightly sweet flavour, and a beautiful soft but crispy mouthfeel, which makes it ideal for adding to a stir-fry or a soup or stew. And here’s the big thing about chayote: it’s packed with folate (vitamin B9), and contains zero cholesterol and saturated fats. It also has useful amounts of vitamin C, other B-complex vitamins, minerals, anti-oxidants, and fibre. Quite a nutritional powerhouse! 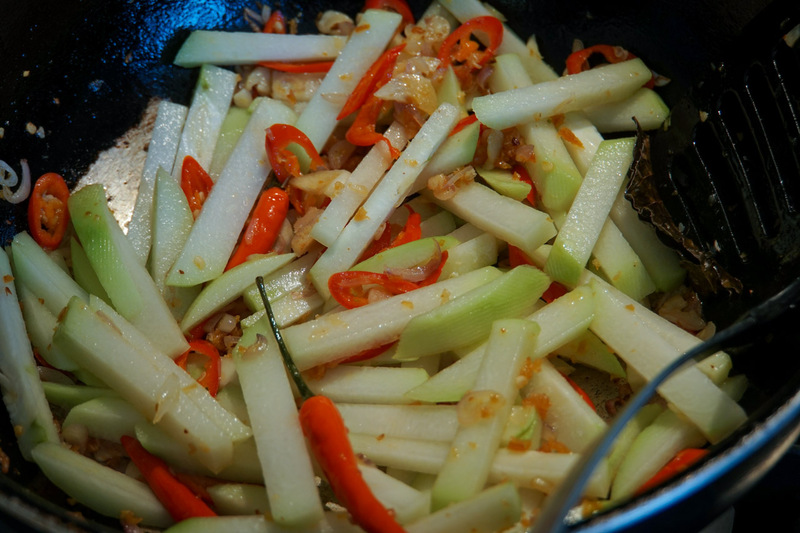 You can find chayote in most Asian supermarkets in the UK—see ‘Where to find ingredients’ in my blog on Sambal. 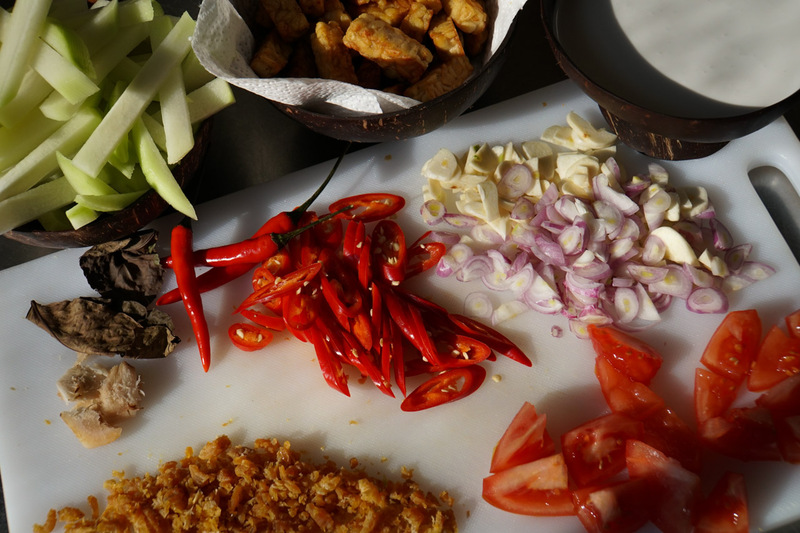 The photos show a very simple one-pan Indonesian dish that I put together in about 20 minutes (most of which is prepping the ingredients). 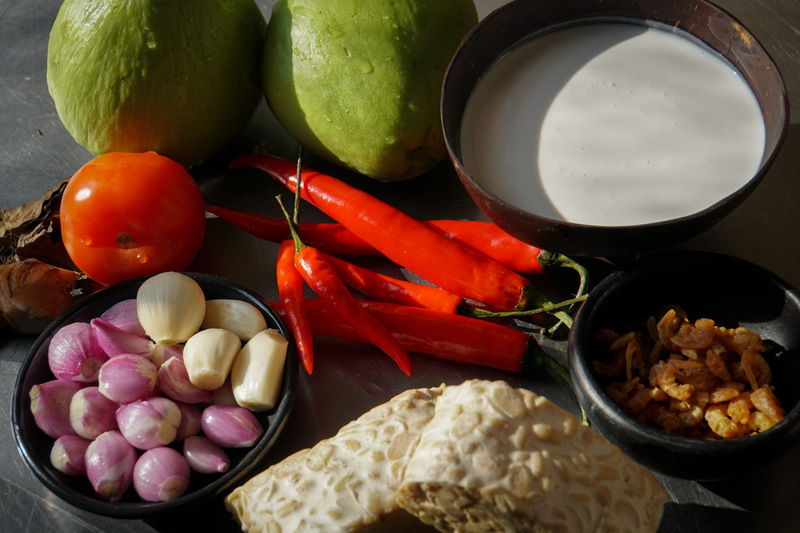 In the first picture, above, clockwise from top-left: chayote, coconut milk, dried shrimp, tempeh, shallots and garlic, galangal, dried salam leaf (bay leaf can be substituted), tomato, and of course red chillies. Basically, chop everything up, and soak the dried shrimp. 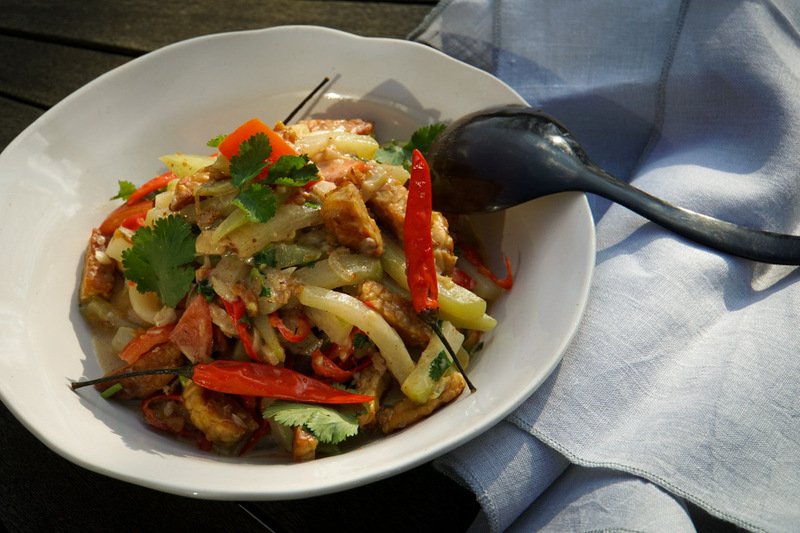 In a large frying pan (ideally a wok) gently fry the tempeh in vegetable oil to soften it, then add all the other ingredients except the chayote, tomato, and coconut milk. After a few minutes add the chayote and carry on frying until it’s soft (about another five minutes). Finally add the coconut milk and tomato, and salt and pepper (don’t be stingy) for the last couple of minutes. Serve with rice. If you’d like a more detailed recipe do let me know. I’ll be happy to let you have one. Enjoy! And think of all the goodness.